Sift Science, the startup forged by a gaggle of former Googlers, is ready for its close up. As of Tuesday, the company is opening up the testing of its fraud-detection service for e-commerce and other sites to the public and has $5.5 million in funding from some heavy-hitter investors to back its play. The San Francisco company, which we covered in October, claims it can scope out more fraudsters before they do harm because it is not constrained by the finite number of rules that most vendors use to flag suspicious activity. “Many anti-fraud technologies follow a set number, maybe 175 to 225 rules, against which to measure user behavior — the problem is fraudsters don’t follow the rules and change all the time,” Sift Science co-founder Brandon Ballinger said in a recent interview. 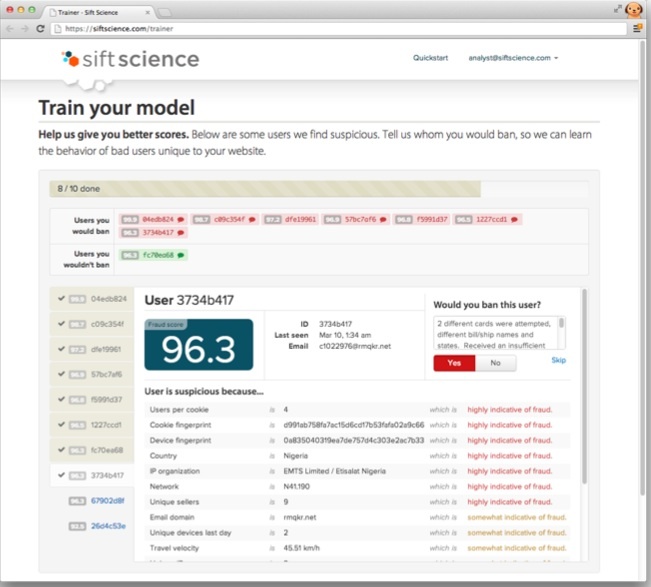 Customers can flag users as fraudsters in order to train Sift Science’s algorithm to spot patterns unique to their site. “We take a machine learning approach to learn from patterns early as they form to predict whether a new user is fraudulent,” he said. Sift Science’s machine learning algorithm has automatically learned one million patterns that predict fraud, and as more sites join the network, it will learn more patterns to help everybody fight fraud more accurately, he said. But the bad guys are always going to change things up to avoid detection. An example, in the past, the most popular time to conduct online fraud was at 3 a.m. local time but now it’s midnight to 1 a.m., Ballinger said. And, while a large percentage of traffic coming out of Nigeria remains fraudulent, a whopping 81 percent of fraud comes from U.S.-based IP addresses. “That means either they’re in the U.S. or are smart enough to use a proxy,” Ballinger said. That fluidity and flexibility is important as is the company’s Google(s goog) DNA. Ballinger said 8 of the company’s 9 employees are engineers and 5 are ex-Google engineers. “We’re taking the Google approach of large-scale machine learning,” he said. Except Sift Science is running on Hadoop, Hbase and MapReduce on Amazon’s public cloud. 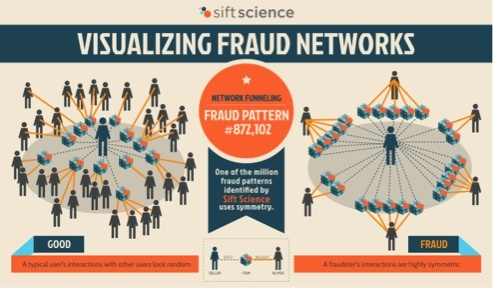 Network funneling is one of many fraud patterns identified by Sift Science, which uses symmetry to detect when a fraudster is funneling money through a large network of accounts. It is thus able to use Amazon(s amzn) Web Services huge scale –and the network effect of all the companies on it — to build its knowledge base. “If someone attacks AirBNB and Affirm we can apply that knowledge and use it elsewhere,” Ballinger said. Sift Science, which relies on what Ballinger calls a dead-simple REST API, will face off against in the fraud detection space including Silver Tail Systems, which EMC(s emc) bought last year and which watches and tracks user navigation trends; and Threatmetrix which watches device IDs. Early customers include payment processors, online retailers, and some name brands including Airbnb and Affirm, Max Levchin’s latest startup. Prospective customers can sign up on Sift Science’s site for the service, which is free of charge for their first 5,000 users, the service is free; after that it’s 10 cents per user.